As an external enclosure for PCIE SSDs, the Zotac AMP Box Mini is something you might want to consider. The read/write performance you’ll get from the Thunderbolt 3 interface is pretty good. However, it is lower than what you’ll get if you installed the PCIE SSD directly on to the PCIE slot of your motherboard. This is expected. With the Patriot Hellfire 240GB PCIE M.2 SSD installed on the Asus Hyper M.2 x16 Card … on CrystalMark, I was able to get an OK read speed of 1463 MB/s and 664 MB/s write. Having said that, it’s almost half of the original speed of 2775 Mb/s read and 1534 Mb/s write. It may sound pretty bad, but remember it’s still faster than your standard SSD on a SATA3 interface. Read the full review of the Patriot Hellfire 240GB PCIE M.2 SSD here. I still think it’s pretty impressive considering it’s gone through several layers of interface. We were unable to test the enclosure as an external GPU, which is unfortunate. My PC system was able to recognize the graphics card, but fails to establish it as a primary graphics card. After doing so research, I was told that if you want to use the Zotac AMP Box Mini as an external GPU… it’s best configure and run it on MacOS/MacBooks. If anyone want to correct me or update me on this, please leave a comment below. Ok, let’s talk about the build quality of the Zotac AMP Box Mini. Overall, it’s pretty solid. The whole chassis is made of Aluminium which helps with the cooling, except the top cover which is made from plastic. Measuring 203mm (L) x 185mm (W) x 100mm (H), it’s quite large for an external enclosure, but space is required if you want to install a graphics card … but only a “mini” graphics card. Standard size or full-length graphics card will NOT fit. The Zotac AMP Box Mini retails for around USD $219 from Newegg, which I think is a pretty pricey for an external enclosure. Basically, you’re paying a premium for the Thunderbolt 3 connector/interface. 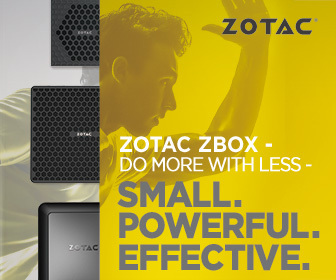 If you’re after an external enclosure with a super fast Thunderbolt 3 connection/interface, suitable for your graphics card or PCIE SSDs, then the Zotac AMP Box mini is your ideal solution. It’s perfect for content creators who want fast external storage which you can edit/render large files directly from the drive. Having an external GPU is no longer a dream, with the Zotac AMP Box Mini you can now take your GPU on the move, and literally game anywhere you want!